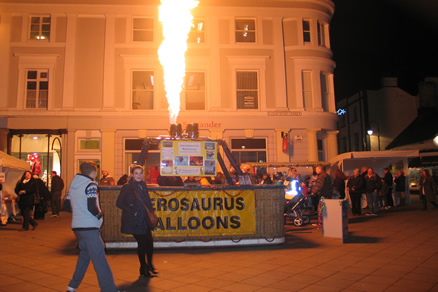 Aerosaurus Balloons coming to a town near you! With Christmas just around the corner it’s time to start thinking about finishing your Christmas shopping and crack out the mince pies! However, if you’re still looking for that ‘perfect gift’ to give someone special, why not treat them to the adventure of a lifetime and memories that will last a lifetime….. A Hot Air Balloon Flight with a traditional in-flight champagne toast! To celebrate the festive season Aerosaurus Balloons is offering some huge reductions on our open-dated vouchers which means you can now fly from as little as £89 per person! We have a fantastic range of flight vouchers, gift options and merchandise to suit all ages and interests and with our online shop offering instant email delivery of our eVouchers, you can purchase the perfect gift right up until Christmas Eve! In the final run up to Christmas we will be visiting a number of local towns and cities to put on a Christmas display with a difference! You can see us tonight on Exeter High Street (Friday 21st December). And if you have trouble finding us don’t worry… just look for the flames as we will be performing several displays using our burners!